Consumption and revenue from non-linear, audiovisual and over-the-top (OTT) services such as Netflix are growing exponentially. These market developments have prompted our discussions about the future of traditional TV with clients around the world, which have focused on strategy analysis and formulation for industry players, assessment of risks and opportunities for investments, as well as review and updates to regulatory frameworks. The majority of these discussions have concentrated on the potential substitution of traditional linear TV by new non-linear TV services. However, in the short- and medium-term, these developments primarily addresses the replacement of the physical video rental and sales market, which has sharply declined in volume and value in parallel with the growth of non-linear audiovisual services. The move from a physical, video market to an online, non-linear market has provided a means to monitor audiovisual consumption, which has not been previously monitored, and what may have originally been perceived as growth is, in fact, primarily a migration of audiovisual consumption from one technology to another. However, this has created opportunities that new players have successfully capitalised on, while only having a limited impact on traditional TV players and consumption to date. In this article, we argue that substitution of traditional TV services with non-linear TV or OTT services will require additional developments and changes across the value chain. It is important to understand the drivers of these developments and changes when developing transition scenarios for TV-like services, as well as the implications for associated strategy, investment and policy decisions. Non-linear and online video service revenue grew at a CAGR of 65% between 2008 and 2013 in Europe, to reach about EUR1.5 billion. During the same period, the physical video rental market has followed a similar – although negative – trajectory to the online revenue growth trend (see Figure 1). 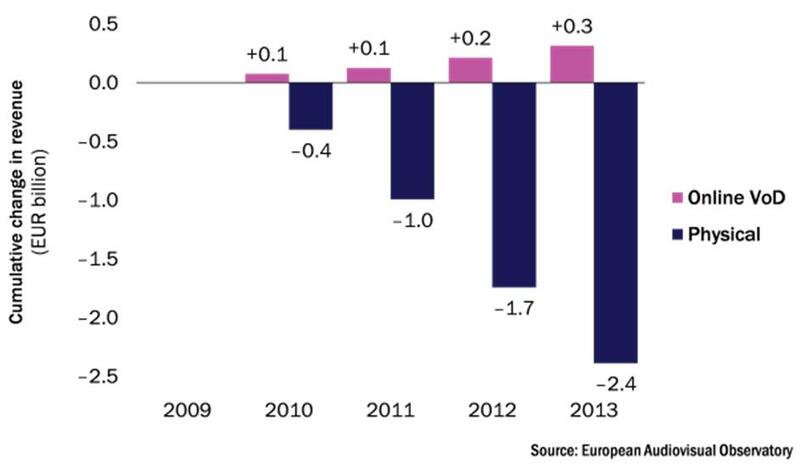 Revenue from physical video services declined at a CAGR of 8.5%, down to EUR6.0 – a loss of EUR3.3 billion. The difference in revenue can be explained in part by the cost savings made by reducing production of physical videos, which are no longer required in the online service model. During the same period, traditional TV revenues remained relatively stable at EUR64 billion, with a CAGR of 0.1%. Online video services’ catalogues tend to focus on films (see Figure 2), which is the type of content offered by physical video rental and sales retailers. However, online video and on-demand providers have recently started to acquire the rights to TV series and sporting events, which typically form the core of traditional TV consumption. This trend is likely to affect the complementarity and substitution of non-linear TV and linear TV. As online service providers gain traction in this space, they can bid for new types of content rights and expand their catalogues to appeal to a worldwide audience, which poses an increased threat to traditional pay and free-to-air (FTA) TV. We believe that as soon as rights holders see the value of this strategy, they will begin to change their strategies and move their rights windows to the new platforms – as they did for DVD and video on demand (VOD). When rights holders begin to change their strategies, non-linear TV could become a clear substitute for traditional TV. Data such as that from the European Audiovisual Observatory suggests that non-linear TV and OTT services have started to overtake the physical video market, but not the traditional TV market. The use of non-linear TV services allows for increased – and more accurate – tracking of the number of minutes of audiovisual consumption, compared with physical video rental and sales, where consumption is not transparent because it is tracked in units. This increased and more transparent way of measuring video consumption provides all players in the audiovisual market with new opportunities to capture and to monetise this audience. As the scale of online video services (either from new entrants or traditional players) expands, new content types beyond film can be included in each player’s catalogues. This will accelerate the opportunity for OTT services to substitute, rather than simply complement, traditional linear TV services. The evolving mix of TV services – both linear and non-linear – will be determined in each market by key decisions made by national and international industry players, investors and policy makers. Players will need to adapt their content sourcing, aggregation and distribution strategies to maximise their opportunity by capitalising on their own strengths in the market, by anticipating these changes and by developing the right content strategies in response. They will also need to develop new tools and strategies to understand and monitor consumption and traffic patterns, and develop loyalty and operational systems to support these strategies.